Theatre Eddys: "Sweeney Todd: The Demon Barber of Fleet Street"
As those tale-summarzing words sink in, one by one others arrive on the London 1875 cobbled and darkened street until the voices of the twenty cast members rise in glorious harmonies at a volume that shakes the timbers of Hillbarn Theatre. 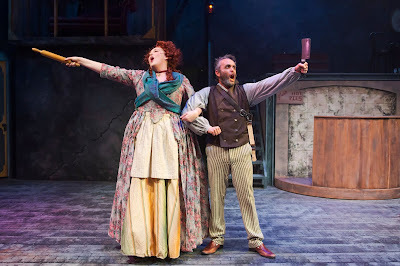 By the time they reach the screeching, hair-raising “Sweeney, Sweeney, Sweeeeeeney,” we in the audience know that we are about to enjoy a world-class production of Stephen Sondheim’s (music and lyrics) and Hugh Wheeler’s (book) Sweeney Todd: The Demon Barber of Fleet Street. Since its 1979 premiere, both musical theatre and opera companies have been challenged with its ridiculously rapid lyrics; songs with ranges stretching several octaves; and a story that is gory, repulsive, and yet altogether compelling (and often funny). 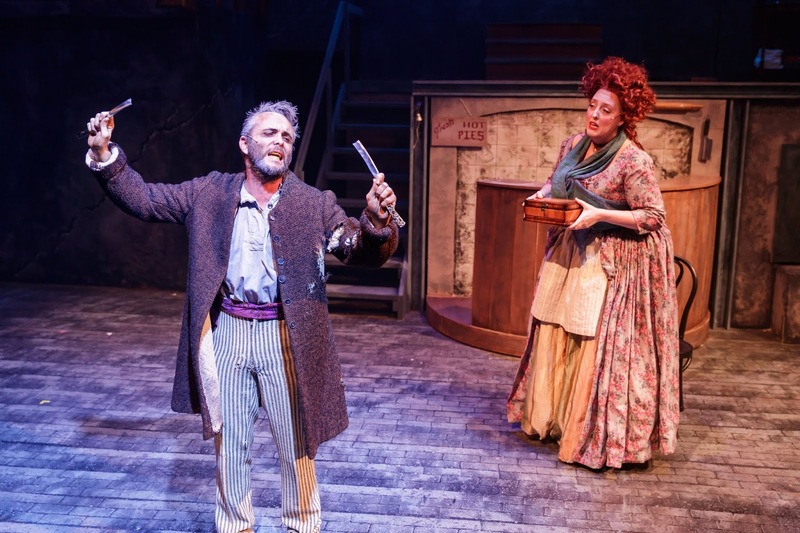 But even against such demands, Hillbarn Theatre opens a Sweeney Todd that is nothing short of a must-see, no matter how many times one has seen the famous tale in the past. For me, this was my seventh time; and the Hillbarn Sweeney ranks up there with the original on Broadway (with Angela Lansbury and Len Cariou), with the 2005 Patti LuPone/Michael Cerveris revival, and with the SF Opera’s 2015 grand edition. And we are hooked. We are putty in his hands. We are ready to know exactly why this man who has just arrived off a boat into the seediest part of London is so pent up in rage. Before we learn, he first must stumble into the worst of meat pie shops, that of Mrs. Lovett (Heather Orth). With red, unruly curls stacked high on her head, she sings in an opera-worthy voice about “The Worst Pies in London,” intermingling her richly beautiful notes with those that cut through the air with a shrieking edge. In one of many inspired directorial decisions that spice up this production, Joshua Marx then sends a cast into the street to re-enact the events that have plagued Sweeney for the past fifteen years of his pent-up rage. As Mrs. Lovett teases her lone customer with a song about “a barber and his wife,” she provides him details he already knows all too well how a barber named Benjamin Barker was banished by a crooked Judge Turpin who coveted Barker’s beautiful, blonde daughter, Johanna. 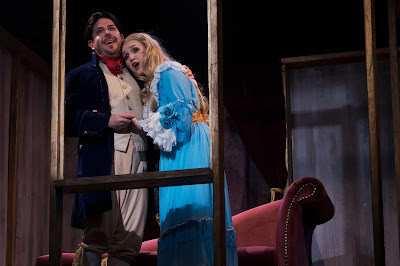 The rage in Sweeney visibly grows as all around we watch events culminate in a bizarre costume ball where masked dancers -- all in many shades of pink -- watch while the Judge escorts a young Johanna off to his home, where she becomes his imprisoned ward. Watching his reactions, Mrs. Lovett recognizes the true identity of this wayward visitor to her pie stand and gives him a set of barber tools she has kept all these years, hoping he would someday return. In an hypnotically powerful voice that once again sends shivers, Sweeney sings of “My Friends,” a strangely alluring love song to the gleaming, silver, barber’s razor he holds above his head. As he sings and plots how the razor will “soon drip precious rubies” as part of his long-sought revenge, Mrs. Lovett plots in an entwined duet how “all your days will be my days,” sweetly singing her own love song to the barber who does not hear. The climax comes as Todd raises his hand gripping the silver-glistening razor, declaring in voice triumphant and thankful, “My arm is complete again,” (all captured in dramatic lighting by designer Pamila Z. Gray as just one of dozens of inspired decisions she makes in illuminating the tale as it unfolds). So struck is she with him, Mrs. Lovett offers Todd a room above her shop to re-open his barbershop where his plan to slit throats of those who have caused his and his family’s demise can take place. Her one-sided love will only increase, leading to Heather Orth’s flowery rendition of a wish where the two can live forever, “Down by the Sea,” with her vocals coming in joyful waves of alternating hushed piccolo and booming trumpet. In juxtaposition to this surreal love duet comes the love story that is at the heart of the tale. From her bedroom window overlooking the street, Johanna (Jennifer Mitchell) sings with a lyrical, fluttering voice “Green Finch and Linnet Bird,” hitting with her soprano notes the kind of stunning ease and clarity that would win any heart. As the notes float into the foggy air, a young man who shared the journey to London with Sweeney Todd, Anthony Hope, is caught by their and her beauty. Yet one more member of this brilliantly voiced cast (Jaron Vesely) comes close to out-performing the last. As he sings “Johanna, I feel you, and one day, I’ll steal you” with such sweet reaches into high, sustained registers, it is difficult to hold back one’s own tears. Sweeney Todd decides he needs to re-establish his own barbering practice in order to attract to his den for their execution, the evil Judge Turpin and his bumbling but equally bad sidekick, the police officer known as The Beadle. He gets a chance to make his mark in a shaving challenge with an Italian street huckster, Pirelli. 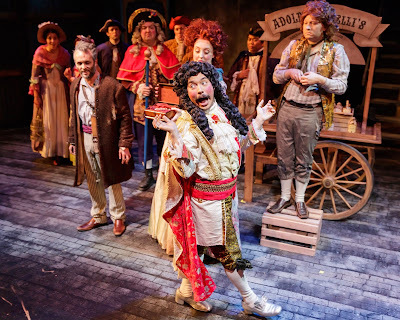 With much flair and flitter, Pirelli (Jesse Cortez) struts into a gathered crowd who have been attracted by the jet-speed spitting of promises about “Pirelli’s Miracle Elixir,” sung by his front-man, Toby (Ross Biscoe). In a contest of who can shave the fastest and smoothest, Pirelli loses to the confident Todd because the Italian’s attention goes into a hilarious delivery of braggadocio sung in a voice high in teetering twitter. Jesse Cortez leaves a lasting impression and an audience with sides aching from laughing in his short, stage stent as the foppish Pirelli. In another of the funnier moments of the musical, Mrs. Lovett and Sweeney realize that the dead bodies that will soon begin mounting in the barber’s shop should not be wasted. Their ‘ah-ha’ that the rat/cat meat she normally puts in her pies could be “priest,” “poet,” and finally “judge” leads to a gustily, raucously sung “A Little Priest.” They tickle themselves as they sing about fried friars, too-salty marines, politicians so oily they run, and piccolo player pies that are piping hot. Keith Pinto and Heather Orth increasingly combine into a Todd/Leavitt pairing that strikes its own path of merit with interpretations wickedly funny, horrifyingly stunning, and ever-more demonizing. The rest of this twenty-person cast takes on both primary and ensemble parts that fulfill Director Joshua Marx’s vision of this sordid, troubling tale. Aisles of the intimate theatre become streets of London where street passers-by provide Greek-like Chorus commentary, singing often inches from audience members with astounding fury, venom, and warning – startling folks in their seats with face-on strident yet magnificent harmonies in unsettling numbers like “City on Fire.” At one point, inmates from an insane asylum escape into those aisled avenues, with anyone nearby finding it difficult not to lean away in some repulsion and maybe a little fear. Beyond those already mentioned, others in this cast are also stellar in their particular portrayals. As Judge Turpin, Chris Vettel uses his rich and resonating bass voice to reach into the depths of pure evil as he sings his own nauseous version of “Johanna.” When he joins Sweeney in a duet of “Pretty Women,” the effect sends shutters down one’s spine as Sweeney’s raised blade stands ready to make the duet a trio. Interrupted and thwarted in his first attempt to realize his revenge, Sweeney’s blood-curling, raging “Epiphany” gives both director and lighting designer more opportunities to prove their merits as he collapses into a puddle of regret at song’s end. Samuel Nachison is the judge’s clownish but black-hearted accomplice, The Beadle. He employees a fabulous falsetto voice and a ridiculously attired aristocratic demeanor to match his overflowing head of curls and puffed-out chest of false importance. 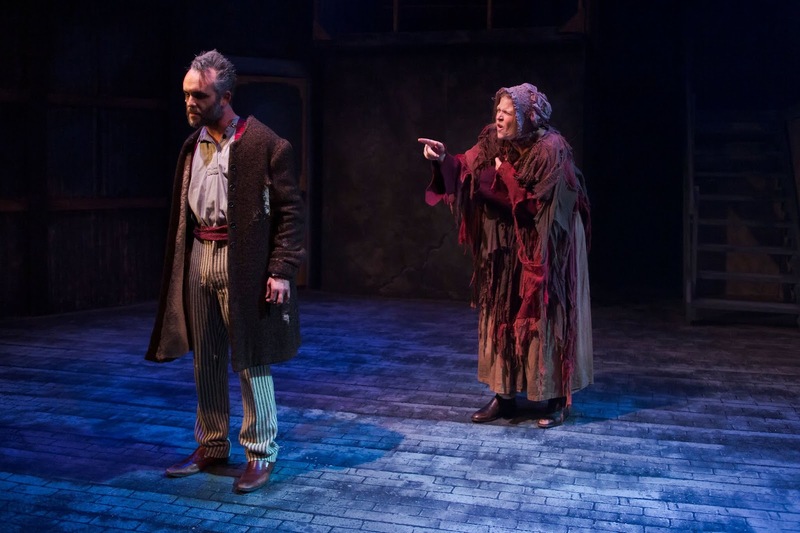 There is nothing funny about the always lurking, roaming Beggar Woman. Juliet Green slinks up and down the aisles and around the dark corners of the stage, singing in spine-chilling warnings while begging alms. As the story’s Cassandra, she sees what others are ignoring, knows much more than others can imagine, and plays a key part in the tale’s climatic, tragic ending that would rival any Shakespearean tragedy with the number of dead bodies accumulated. Juliet Green is nothing short of scary and stunning as the street woman in rags who carries secrets only Mrs. Lovett knows. Also playing a big part in the tale’s turning ever into a even darker, sadder story is the role of Toby, the simple-minded but sweet boy (and once street barker for Pirelli) who helps out in the pie shop and believes no one is nicer than the Mrs. Lovett who knits him a scarf and treats him almost like a son. When Ross Briscoe sings wide-eyed and with nervous intensity inches from Mrs. Lovett’s face, “Nothing’s going to harm you while I’m around,” he too clearly seems to sense pending disasters that the pie lady totally is ignoring in her blind adoration of the barbarous Todd. To attend a Sondheim musical is to hope that one is able to grasp the vast majority of the oft-bullet-speed lyrics. Between the outstanding musical direction of Rick Reynolds, the noteworthy dialect coaching of Nancy Carlin, and especially the evident success of Brandie Larkin’s sound design, I am here to say not one word escaped my understanding by either principal or ensemble member. In addition, the balance between the singers and the highly impressive fourteen-member orchestra under Mr. Reynolds’ direction is sound-perfect throughout (the orchestra rivaling the sounds of any large touring musical’s orchestra I have heard recently). But more stars abound in this production that is already asking to be on everyone’s 2019 “Best of the Bay” lists. Yichuan Sharon Peng’s costumes, wigs, and make-up artistry are a show unto themselves, with the streets and societies – both ragged and rich -- of 1875 London parading before us, telling their own history and accounting their own portion of the plot. My dear reader, if you are not yet convinced to make your way immediately to buy a ticket to Hillbarn’s production of Sweeney Todd: The Demon Barber of Fleet Street, I am not sure what else this humble reviewer can say. 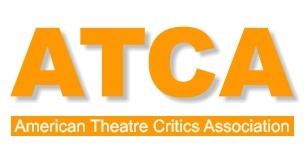 Just do so before the show too soon closes on February 10, 2019. 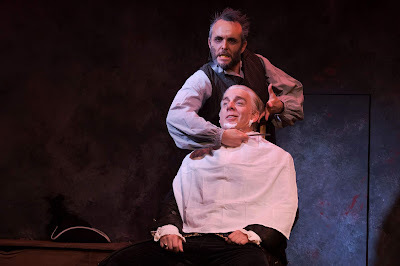 Sweeney Todd: The Demon Barber of Fleet Street continue through February 10, 2019 at Hillbarn Theatre, 1285 East Hillsdale Boulevard. Tickets are available online at http://www.hillbarntheatre.org or by calling 650-349-6411.